Wally West and Wally West spend an issue together, as Joshua Williamson pauses for a breath between story arcs. There is a reference to Rebirth, and Barry Allen lets the cat out of the bag, but overall it’s the interaction between the two Wallys that carries the tale. While the elder Wally knows that his namesake is the new Kid Flash, that secret is not returned. The two work together to save Barry when the speed force overwhelms him. The younger Wally learns that his uncle Daniel is actually his father. 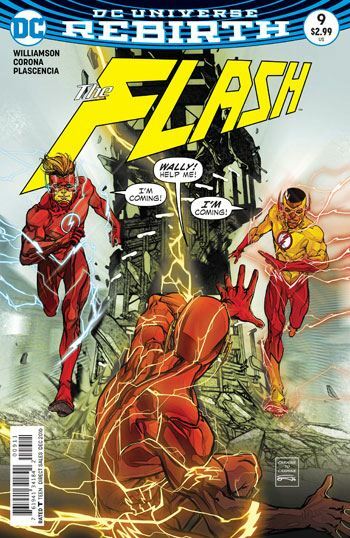 Artist Jorge Corona does a commendable job coming in for this issue, and his facial work on young Wally when he confronts the other speedsters about how long they knew the truth is very effective. The true bond that the Wallys West share is not their speed, its their relationships with their Aunt Iris. Iris’ role in shaping the new Kid Flash had been discussed in the previous issue, and in this one the elder Wally reveals how much her influence helped him when he was living in his tense home environment as a kid. The tale closes with a wonderful tease. Spoiler worthy, so I won’t say anything.